It’s the beginning of asparagus harvest season. It’s true that many markets will carry asparagus most of the year, but if it is August, you can bet it wasn’t grown anywhere in this hemisphere. And asparagus is one of those vegetables that is at the peak of its flavor and texture if eaten within a day or so of when it was harvested. This delectable green shoot vegetable is native to the coasts of several Mediterranean countries. So, the cooler, coastal, or nearly so (just over a low range of hills in the Salinas Valley, for instance), California zones are ideal for growing it. As a perennial, it requires a commitment on the part of a farmer to devote his acreage solely to this crop for a minimum of two years before any harvest is realized and then to continue to cultivate the beds for 10 years or more. No wonder it commands such a premium in the market. What’s great is that it isn’t too late to plant your own asparagus patch. It is possible to start from seed, but you will gain at least two years of time by planting bare-root plants. You will still have to wait two years before enjoying your first harvest, but the luxury of having it available from your own garden will be worth it. Bare-root plants may be available in area nurseries, but also are found reliably by mail. Asparagus does require some space. Plants should be set 18 inches apart in rows that are four feet apart. Start by digging a trench six inches deep. Fluff the soil at the bottom and lay the plants on the surface, spreading out the roots evenly. Cover with two inches of soil and continue to add soil as the shoots grow. Do not bury the shoots; always leave the tip exposed. The soil should be rich in organics and also well-draining and, once the trench is filled in, mulch to conserve moisture and deter weeds. For the first couple years, allow the shoots to mature into very ornamental and fern-like plants. Once they turn brown and drop their leaves, the stalks can be cut down and the bed mulched again to maintain fertility. Once the plants are sending up juicy, thick (one half to one inch in diameter) shoots seven to nine inches high, cut them just below the soil surface and rush them to the kitchen. Leave any slender stems as they will be tough. If you can’t eat them immediately, stand them upright in an inch of water and cover with a plastic bag to keep them fresh and crisp. Their sugars will begin to turn to starch very quickly, so time is of the essence. After six to eight weeks, the new shoots will be very slim and tough. It is time to stop cutting and allow them to form the leafy plants that can photosynthesize, and feed the underground rhizomes for another year’s harvest. There are several varieties from which to choose. Tried-and-true cultivars are ‘Mary Washington,’ ‘Jersey Giant,’ or ‘Jersey King.’ Another selection, ‘Sweet Purple,’ makes spears that are a lovely shade of burgundy red. White asparagus is more popular in Europe and is deprived of light by mounding the soil against the forming shoots, thus inhibiting the formation of green chlorophyll. They are less sweet (photosynthesis is the process by which plants produce sugars using the energy of the sun) and usually tougher, requiring peeling away the outer layers before cooking. Speaking of cooking, the sweetest, young spears are as delicious raw as they are cooked. Raw, steamed, or roasted, asparagus is the very taste of spring. Any treatise on asparagus must make mention of its curious chemical signature. The flesh of asparagus contains a sulfurous substance called asparagusic acid. This compound is a close cousin to the rather pungent methanethiol, one of the components of the skunk’s defensive spray. 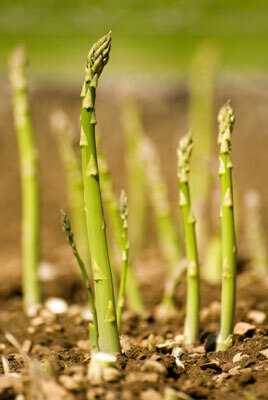 In the small amounts processed by humans that consume asparagus, the odor is much milder and restricted to their urine. Although some people claim immunity from this metabolic byproduct, it turns out that all of us do produce the signature smell, although a few, in a genetically linked community, are simply unable to smell it. Surely a small price to pay for such a delicious and healthful vegetable treat.